Jays in the House: Should the Blue Jays Consider Employing a Four-Man Outfield? Should the Blue Jays Consider Employing a Four-Man Outfield? On a recent episode of an Effectively Wild podcast, Ben Lindbergh and Jeff Sullivan brought up a few things regarding outfield shifting. Lindbergh recently wrote a great article chronicling the past, present, and future of defensive shifting in the outfield. It's a long piece, but if you are as interested in what potential shifting opportunities there are I'd highly recommend going to read it. One interesting player who meets those criteria is Mike Trout, who pulled over 80% of his ground balls. Joe Maddon was the most notable one to employ such a shift when he employed a four-man outfield on Joey Votto. It didn't work out so well. The point of a shift is to align your defenders in a way that maximizes the potential to limit bases or to create outs. No shift will ever work 100% of the time. Failing to record an out on the first attempt should not be a reason to not attempt again. What if Maddon tried it another 4 times and it worked every time? The experiment would be considered a success and more managers would be open to trying it. One time is too small of a sample to rule the experiment out completely. Using the FanGraphs splits tool, there are three names I want to highlight among fly-ball leaders. They are J.D. Martinez, Aaron Judge, and Giancarlo Stanton. Those three are in the top 3 in every major category regarding fly ball data; wRC+, OPS, and are 3 of the top 4 in batting average, with xwOBA darling Jose Martinez joining the mix. Matt Olsen was the only player that had a higher HR to FB ratio than those three. The following table splits the AVG, OPS, and wRC+ by ground ball and fly ball. The fly ball rate stats obviously are much higher because they include home runs, as home runs still count as balls in play and the Splits Tool options don't let you phase HRs out, unless I'm missing an option somewhere. Realistically, though, it doesn't matter where you align the defenders if the ball is hit into the outfield seats. It's evident that these three sluggers generate all of their value by elevating the baseball. Statistics like these are nothing new - it's why we are seeing an era of the 'fly ball revolution', with swing changes, launch angles, and more home runs in the game than ever before. Changes in the baseball might have something to do with the power surge, but the game is clearly shifting. It's time to counter the shift at the plate with unique shifts in the defense. If removing an infielder and adding an outfielder makes any of these big time power hitters change their approach, it could be considered a win in itself. Let them have the base hit if they want to inside out a ball the other way. It would be a way of neutralizing their power without simply intentionally walking them. If they didn't change their approach, you would be better equipped to defend their fly ball tendencies. One factor that August Fagerstrom didn't mention in his article was pitching tendencies. The Blue Jays currently employ two pitchers in the top 10 in fly ball percentage, in Marco Estrada and Danny Barnes. Marco Estrada is penciled into the starting rotation. Barnes is a good candidate to be in a medium to high-leverage role in the Blue Jays bullpen. The three hitters highlighted above are all right-handed, and all in the Blue Jays division. Danny Barnes is right-handed and likely to face these batters in possible high-leverage spots. Marco Estrada works a fine line between giving up a lot of weak contact and fly balls, and could benefit from having an additional outfielder to cover the range in the outfield. 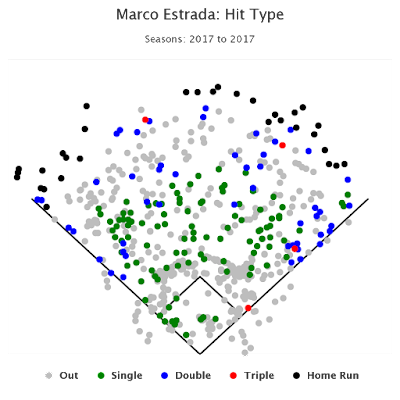 Here is an interesting spray chart from Estrada in 2017. 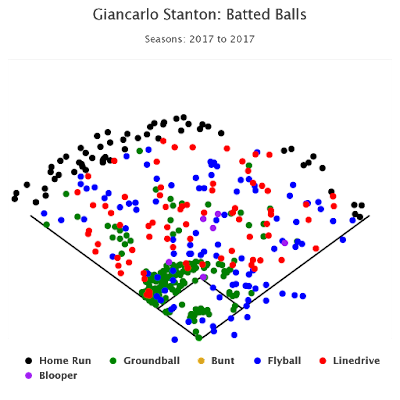 Now that we have a pitcher that naturally generates a ton of fly balls, let's look at the spray charts of the three players mentioned above. 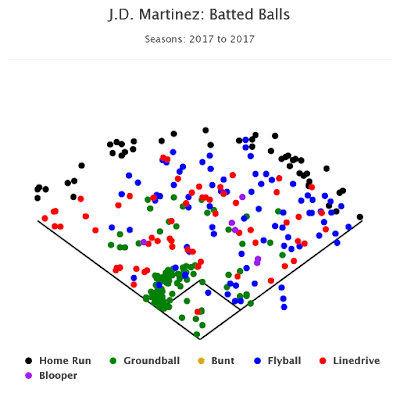 Note the cluster of ground balls to the pull side of the infield for each player, as well as the blue and red dots (in Estrada's chart) which are non-home run extra basehits. The goal of adding an extra outfielder would be to greater defend these types of outcomes. I think the key here is the ground ball clusters. 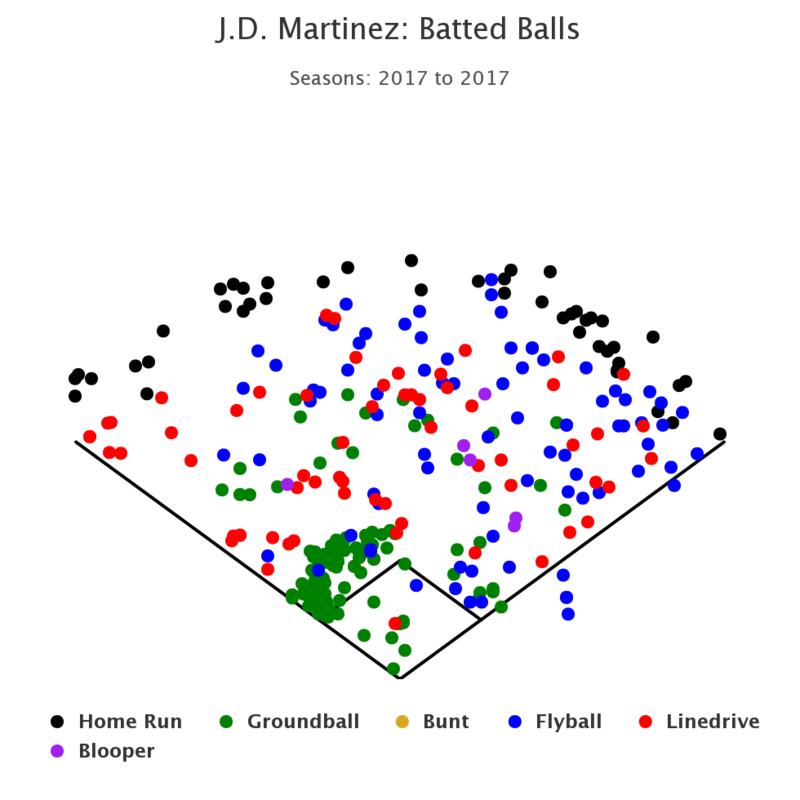 J.D Martinez hits 10% of his ground balls to the opposite field, but over 40 percent of his fly balls are to the opposite field. He lead the league in ISO to the opposite field in 2017. He has power to all fields. Yet that doesn't translate in the infield, where he pulls over 60 percent of his grounders. 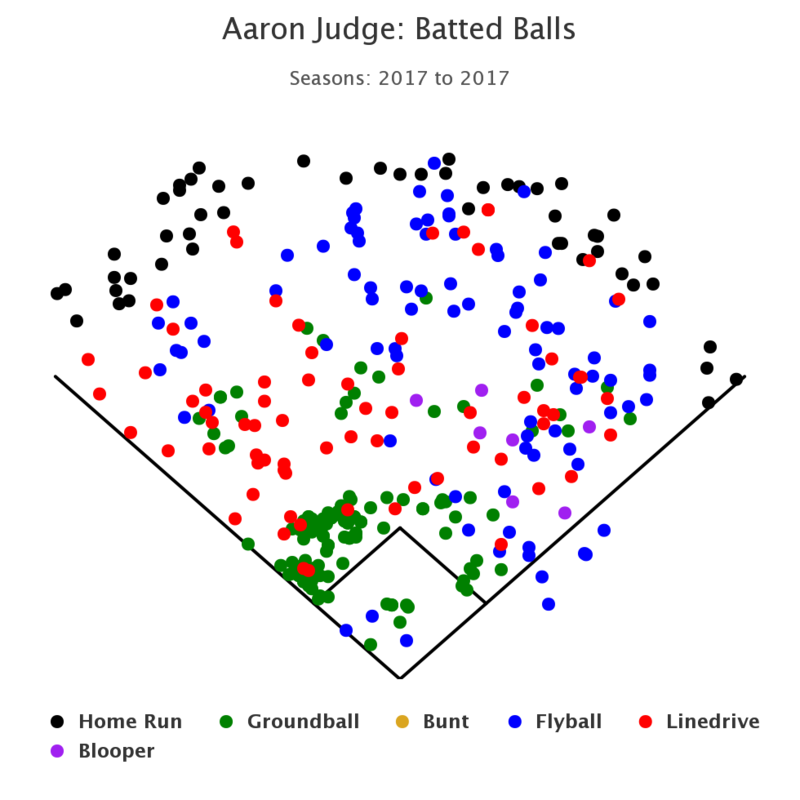 Aaron Judge also pulls over 60 percent of his grounders, and only hits 13 percent of his grounders the other way. He has an balanced fly-ball profile (22.6% pull/35.6% center/41.8 oppo). 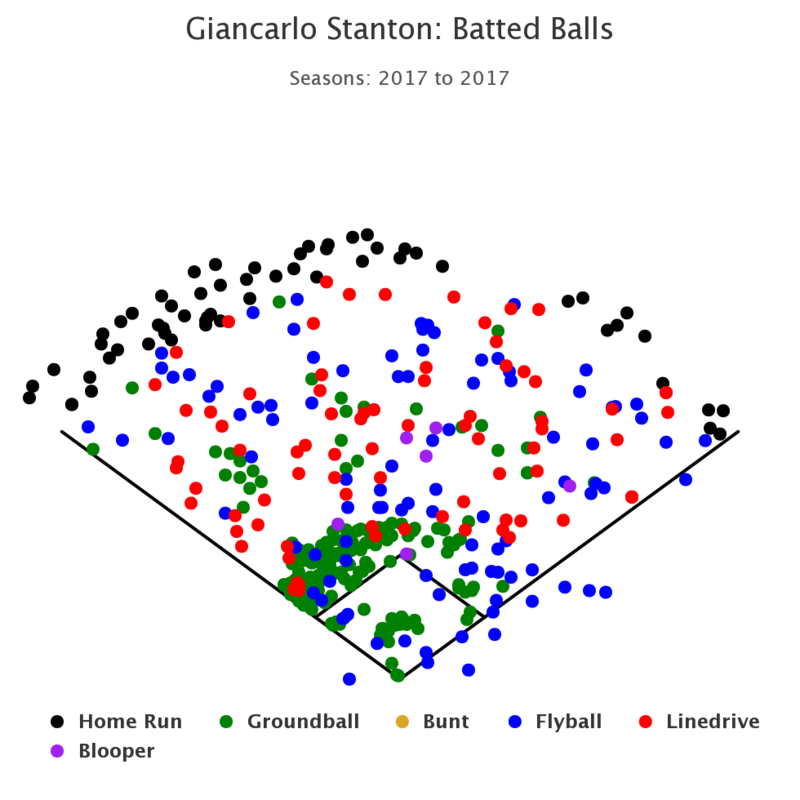 Stanton has the lowest oppo ground ball rate at 7.7 percent, though he hits more of his balls up the middle than the other two. He also has one of the most balanced FB batted ball profile (32.6/33.1/34.3). An outfield with two men playing in the gaps and the traditional right and left fielder shading closer to the line seems like it would be more beneficial than having a traditional second baseman on the infield. Yangervis Solarte was a solid move for the organization this summer. He is able to provide roster flexibility for just $2.5 million this year and $4 million the next, while guaranteeing close to every day playing time bouncing between second, short, and occasionally third. In this projected fourth outfield scenario, I envision him being able to slide to the outfield, leaving the best defender, Kevin Pillar, to play right field, but shading towards the opposite field gap. The outfield certainly has a lot more flexibility this year with the addition-by-subtraction of Bautista's defence, while acquiring a few good defenders in Granderson, Grichuk, and Hernandez, not to mention a talented defensive outfield slated to start in Buffalo. You could spread them out, in a no-doubles defense, or you could stack them, leaving a guy shallower to maybe take away a shallower single. These are untested waters, so there is no precedent on the proper way to position everyone. It's about covering the most ground possible while limiting the extra-base hit. Bringing an extra man into the outfield would leave additional room in the infield uncovered. It would be unwise to incorporate this with guys like Marcus Stroman, who has had back to back seasons with a ground ball rate over 60 percent, or Aaron Sanchez and Jaime Garcia, who both have ground ball percentages over 55 percent. Ideally, this would work best on days where Gift Ngoepe is one of those infielders, as he has the most range of all the options. He doesn't have quite the bat that some of the other middle infielders, so it's unlikely it would make sense to bring him in for this specific scenario. There is definite downside to a 3-man infield. Donaldson and Tulowitzki have both shown to be good defenders, but it might not be the best idea to stretch their limits too much. Justin Smoak would probably be asked to cover too much ground. It's not something that would work on a regular basis. At the very least, on days where Estrada is starting, it would make sense to field the best defensive outfield, while being open to new ideas of outfield alignment. If shifting against these in-division power hitters causes them to hit less homers and doubles and a few more singles, than that could be considered a win. If you think about the baseball field from a square area perspective, the defensive alignment really is quite backwards. You have four defenders on the infield, plus a pitcher and a catcher. The outfield is a much bigger area, yet traditionally teams have always employed three defenders. A four man outfield has only been attempted a few times, but with a league-wide trend of fly balls on the rise, it makes sense to re-consider the way we traditionally think of the defensive spectrum.